In just under a month, the sixth installment of Paramount's Mission: Impossible franchise, Mission: Impossible Fallout, will hit theaters, bringing Tom Cruise's iconic Ethan Hunt character back for another edge-of-your-seat adventure. As we get ready for Ethan Hunt's return, and what has been said to be Tom Cruise's most death-defying stunt yet, we're going to revisit the franchise from the beginning, examining one movie a week before Fallout's release on July 27, and we begin with the one that started it all ,1996's Mission: Impossible. Tom Cruise had already been a global mega-star by the time he came aboard to star and produce Mission: Impossible, which was the first film produced under his Cruise/Wagner Productions company with longtime producing partner Paula Wagner. This franchise, however, would help Cruise cement his legacy as one of the few action stars who insists on doing all of his own stunts, which have increased exponentially in size and sheer spectacle throughout the years. There would be no scaling of the Burj Khalifa in Ghost Protocol or the cargo plane takeoff scene in Rogue Nation if it weren't for the bullet train leap in this film, which still holds up as an impressive scene, 22 years later. 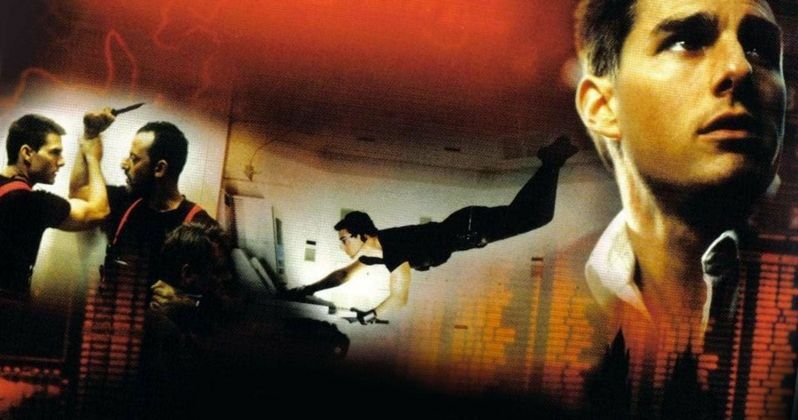 Mission: Impossible grossed $180.9 million domestic in 1996, which doesn't seem like much these days, but back then, it was the third highest-grossing movie of the year, behind Twister ($241.7 million) and Independence Day ($306.1 million), and just ahead of another Tom Cruise hit, Jerry Maguire ($153.9 million). The movies that have followed have been relatively consistent at the domestic and worldwide box office and while they don't finish near the top of the yearly charts, it's clear the audience is still there, despite sometimes large gaps in time between the films. With six films produced over a 22-year span, the focus is definitely on quality over quantity, which Tom Cruise, as a star and producer, has continued to deliver, over and over again. For those whose familiarity with the franchise starts and ends with the movies, Mission: Impossible has always centered around Ethan Hunt, played by Tom Cruise, but that character was brought to life specifically for the movies. The 1960s Mission: Impossible TV series centered on the Jim Phelps character, played in this film by Jon Voight, with some longtime fans taking umbrage with the fact that Phelps took a back seat to Cruise's new Ethan Hunt character. Mission: Impossible also introduced the Luther Stickle character played by Ving Rhames, the only character except Hunt himself who has appeared in all of the movies. Aside from Hunt and Stickle, though, the team is quite different, with tech specialist Jack (Emilio Estevez), undercover operative Sarah (Kristen Scott Thomas), Phelps' wife Claire (Emmanuelle Beart) handling transportation and Hannah (Ingeborga Dapkunaite) who kept an eye on the target. Portraying the first in a rotating crop of IMF heads is Henry Czerny's Kittridge, while Jean Reno plays Krieger and Vanessa Redgrave plays the devilishly delightful arms dealer known as Max. The Mission: Impossible franchise is usually never too far removed from a big twist, and while there are a few good ones here, this first film is a much more straight-forward affair than its predecessor. This isn't terribly surprising since it's the shortest movie in the franchise at 110 minutes, with the runtime growing and growing to the rumored 147-minute runtime of Mission: Impossible Fallout. Anyway, this first Mission follows Ethan Hunt and his team to Prague to catch a bad guy in the act of stealing the CIA Noc List, a list of all covert operatives in the field, with both their code names and their real identities. When Hunt learns this operation was all a mole hunt, and the IMF thinks he's the mole, he sets out to steal the real NOC List to draw the mysterious traitor known as Job out of hiding. Clandestine shenanigans ensue, and fake latex face masks are torn off in dramatic fashion. Everything has to start somewhere, and the tradition of the franchise delivering the most incredible stunts committed to celluloid starts with the bullet train sequence in Mission: Impossible. The sequence starts with Phelps trying to escape on the top of the speeding bullet train, while Hunt gives chase and clips the helicopter flown by Krieger onto the train, forcing it to follow the train into the tunnel. The stunt, and the film's big climax is when Hunt makes a daring leap from the train to the helicopter, then using his exploding Big Red gum to blow up the helicopter, with the explosion propelling him through the air, back onto the moving bullet train. The shot of Cruise landing on the train was featured in all of the trailers and certainly played a huge part in the film's success. While it may seem "weak" in comparison to the stunts that followed, there's no denying this innovative stunt put the franchise on the map and lead to bigger and much more death-defying stunts. Mission: Impossible holds up incredibly well after 22 years, a statement that can't be made about many movies these days. The story is incredibly lean and fast-paced, with no story beat or line of dialogue going to waste, a trend I'd like to see return to big-budget action movies, instead of two and a half hour affairs. Be sure to check back next week when we delve through perhaps the most divisive movie in the entire franchise, 2000's Mission: Impossible II, as we continue the countdown towards Mission: Impossible Fallout, in theaters July 27.